Four of the five cases within a 347-mile radius. Figure 1: Distances by road from different points: 1: = 870 miles (1,400 km); 2= 1,400 miles (2,253 km); 3: 350 miles (563 km); 4: 800 miles (1,288 km); 5: 500 miles (800 km); 6: 317 miles (510 km). Red circle shows the location of cases 2, 3, 4, and 5 in a radius of 347 miles (550 km). This case is relatively small, especially compared to an ASF-infected farm in Romania where 140,000 pigs are being killed this week. However, the widespread nature of the reported cases continues to cause concern, as no mechanism of transmission has been reported and, conversely, potential mechanisms suggest the potential for many more cases. The trade and transport of pigs is, of course, a major concern and should be easily identified through traceback of farm inventories. Contamination of trucks, along with inadequate sanitation should also be relatively easy to trace. If a connection between the herds is not easily identified, it suggests that there are other contaminated materials that are being transferred between farms, with history showing the most likely being contaminated pork products fed to pigs, people or equipment moving between farms and/or feed ingredients. The additional concern is that these methods of transmission also increases the likelihood that other countries, including the United States, can also be affected. 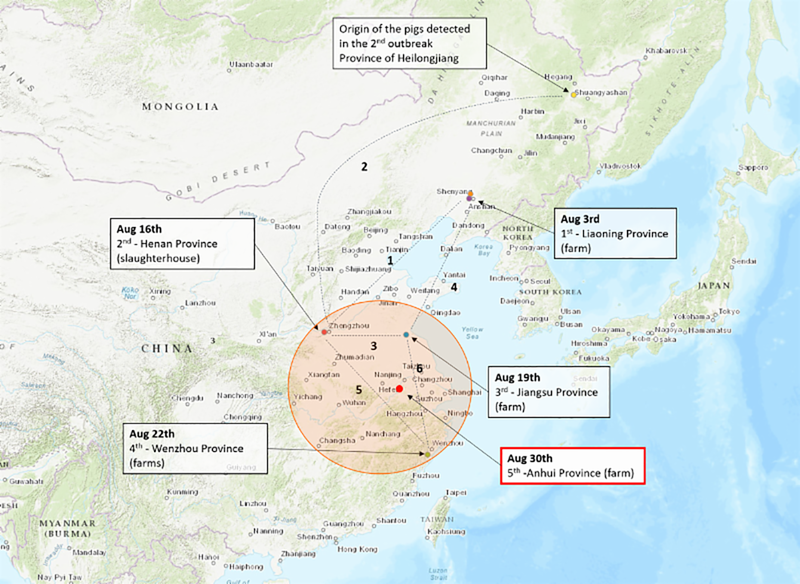 This risk is exemplified by the fact that South Korea detected evidence of the virus in foods containing pork that were brought in by airline passengers coming back from Shenyang on Aug. 3. The U.S. pork industry organizations have developed a list of actions that could help prevent and then, if needed, respond to an ASF incursion. They have been shared with USDA and urgent work and further discussion about them is ongoing. Urgent prevention initiatives are prioritized above response initiatives. • Review your biosecurity protocols with your veterinarian and commit to their implementation every day. • Prepare your farm for enrollment in the Secure Pork Supply. Resources and instructions can be found at SecurePork.org. • Fill out a Foreign Animal Disease Preparation Checklist for your farm. • Visit with your feed supplier about the ingredients used in your diets. A list of suggested topics for discussion with feed or feed ingredient suppliers will be forthcoming. • With the best information currently available, and until we learn more, extreme caution should be taken when considering hosting someone on U.S. farms from an ASF, or another FAD, positive region of the world. If it is needed, the USDA Foreign Animal Disease Diagnostic Laboratory on Plum Island requires a five-day downtime for anyone planning to have contact with susceptible species after working with diseases and animals.